Important This article details the old integration between Box and Google Docs. As of January 2019, we have stopped supporting this version of the integration. We strongly recommend upgrading to the new and improved Box for G Suite integration. If you are implementing the Box for G Suite integration for the first time, please start with the new and improved Box for G Suite integration. All Box accounts are easily configurable for use with Google Docs and Google Sheets. 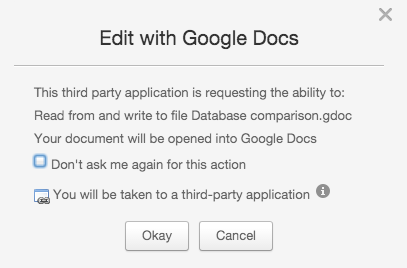 Note: When integrating with Google Docs, make sure 3rd party cookies are enabled in your browser. In Chrome, cookie settings can be adjusted under the Chrome menu on the browser toolbar. To change your cookie settings, select Settings > Show advanced settings. In the Privacy section, click Content settings and adjust your settings in the Cookies section. To set up the integration, follow this process. Click Google Doc or Google Sheet. Assign a name for your document and click Okay. If you are already signed into your Google account, click Accept to grant Box permission to store your spreadsheets or documents on Box. 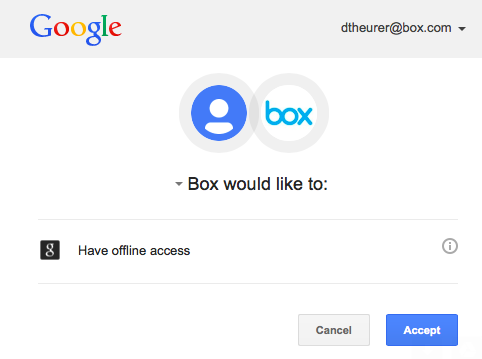 Click Okay to allow Box to connect to your Google account. While the icon indicates that the file is being used, you can also join in to collaboratively edit this shared document. See Enabling Concurrent Editing for additional information. To complete your integration updates, Box guides you through an authentication flow that pairs your Box and Google accounts. When you connect to a Google document or to edit a file using Google docs, you will be upgrading to the new integration and will follow this process once. 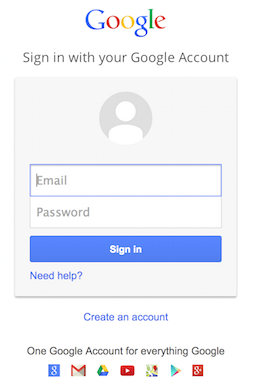 You will be asked to log into Google. Click Allow access to grant Box permission to store your spreadsheets or documents on Box. If you see a blank page when you try to edit a Google document, verify that you are signed into Google using the Google account associated with your Box account. The blank page is a Google security measure. Go to your Box account and click the dropdown list next your name. Select Account Settings. Scroll down to the Applications Linked by Single Sign On section. Reset your account association. 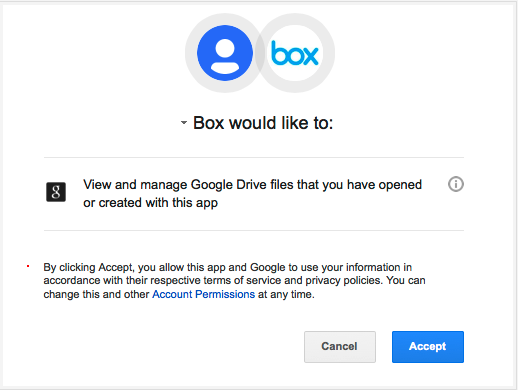 The next time you open a Google document, you will be prompted to pair your Box and Google accounts again as described in the Upgrading to the Google Docs integration section. Note: The Google images displayed in this article differs based on the Google Docs and Google Drive version currently in use.